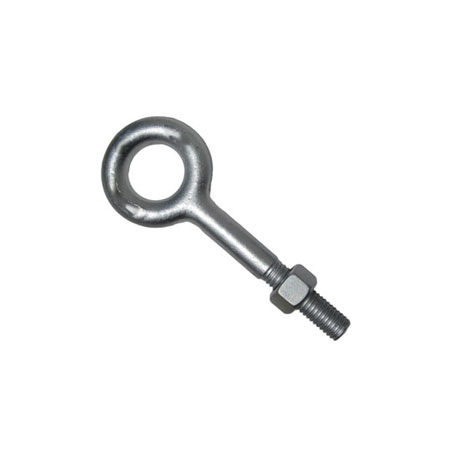 ﻿ Eye Bolts, Stainless Steel Shoulder Eye bolts Exporter. ASTM A325 Eye Bolts Manufacturer, Carbon Steel Eye Bolt Exporter, Eye Bolt As Per Drawing In Type, SS Shoulder Eye Bolts Stockist Supplier In Worldwide. Eye Bolts are a kind of bolt that has a loop at the end. 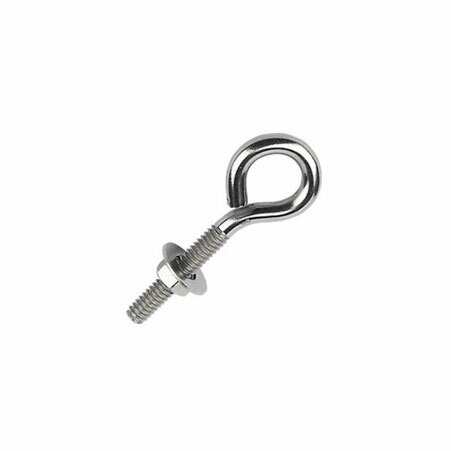 These types of bolts are widely used to attach the securing eye with the structure so that cables and ropes can be tied easily with it. 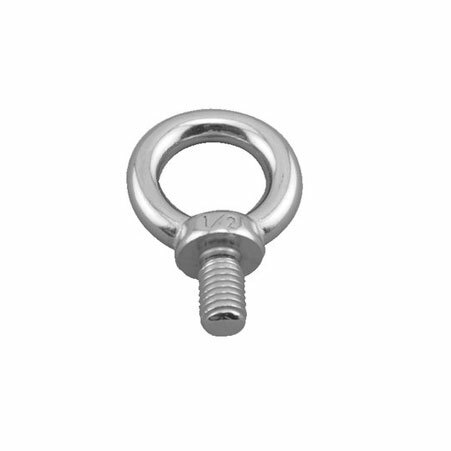 These SS Shoulder Eye Bolts are completely threaded and often have a collar that makes it the most suitable for use with the angular loads of up to 45 degrees. There are different types and forms of bolts offered to customers as per their demand and application requirement. Amcometals, one of the leading manufacturing industries are aimed to offer a high and comprehensive range of bolts and are engaged in fulfilling all the demands of customers. While manufacturers cover all these standards, there are various tests and inspections done. All these testing and inspections are done in the supervision of experts as per the industrial norms. For all these tests, various test certificates are approved. In the end, these Eye bolts are packed in wooden cases or carton which in turn prevents rusting and damages until its last stage of production. Stainless Steel Eye Bolts Manufacturer, Steel Forged Screw Eye Bolt As Per Drawing In Type, Duplex Steel Metric Machinary, Hastelloy Eye Bolts Supplier In India. Stainless Steel Eye Bolts : AISI 302, 304, 304L,316, 316L, 310, 317, 317L, 321, 347, 410, 420,904L etc. Spain, Belarus, Ireland, Costa Rica, Lebanon, Iraq, Romania, Belgium, Chile, Qatar, Nigeria, Malaysia, Singapore, France, Zimbabwe, Italy, Puerto Rico, Lithuania, Russia, India, Argentina, Nepal, Vietnam, Turkey, China, Trinidad & Tobago,Tunisia, Hong Kong, Morocco, Portugal, Mexico, Estonia, Germany, Serbia, Switzerland, Slovakia, Netherlands, New Zealand, Iran, Iran, Azerbaijan, Greece, Thailand, Bahrain, Taiwan, Chile, Poland, Saudi Arabia, Sri Lanka, Afghanistan, Bolivia, Macau, Oman, Finland, Israel, Algeria, Libya, Philippines, United States, Croatia, Australia, Kuwait, Yemen, Mexico, Jordan, Tibet, South Africa, United Kingdom, Gabon, Norway, Bulgaria, Brazil, Austria, Gambia, United Arab Emirates, Mongolia, Nigeria, Bhutan, Ecuador, Ukraine, Czech Republic, Hungary, Venezuela, Sweden, Ghana, Colombia, Angola, Kenya, South Korea, Egypt, Japan, Peru, Canada, Indonesia, Namibia, Kazakhstan, Bangladesh, Poland, Denmark, Pakistan. Muscat, Cairo, Surat, Dammam, Vadodara, Hong Kong, Toronto, Algiers, Edmonton, Ernakulam, Noida, Bengaluru, Jakarta, Navi Mumbai, Doha, Montreal, Los Angeles, Perth, Jamshedpur, Ranchi, Thiruvananthapuram, Lahore, Tehran, Baroda, Lagos, Caracas, Ludhiana, London, Rajkot, Howrah, Bangkok, Faridabad, Hanoi, Riyadh, Nagpur, Petaling Jaya, Busan, Pimpri-Chinchwad, Dubai, Manama, Courbevoie, Mumbai, Colombo, Atyrau, Kuwait City, Secunderabad, Nashik, Houston, Al Khobar, Ankara, Dallas, Kanpur, Chiyoda, Coimbatore, Calgary, Karachi, Aberdeen, Thane, Singapore, Kuala Lumpur, Indore, New Delhi, Mexico City, Milan, Hyderabad, La Victoria, Jeddah, Ulsan, Chandigarh, Visakhapatnam, Sharjah, Rio de Janeiro, Ahvaz, Ho Chi Minh City, Bhopal, Port-of-Spain, Jaipur, Kolkata, Melbourne, Geoje-si, Ahmedabad, Gurgaon, New York, Granada, Abu Dhabi, Madrid, Sydney, Pune, Brisbane, Istanbul, Santiago, Moscow, Haryana, Seoul, Al Jubail, Vung Tau, Gimhae-si, Chennai, Bogota.